In my wood shop, I have been working on necks for box guitars and have three basic styles differing in their design and in their complexity to make. In addition I'll add fretted versions, and also use off-the-shelf fretted ukulele fingerboards that come ready made. With necks underway, I'm turning my attention to making boxes for the bodies. Some will be similar to those I made at school, including the classic "k" body. Others will involve bent wood, using simple techniques like that shown in the image above. A more recent study found that Not only are lectures boring, they are ineffective, too. It is extremely unlikely that such research will change anything. Schooling is much more about the pretense that society cares about kids, and much less about bringing forth holistic values through education. At the beginning of the 18th century Comenius had described accurately how children learn. Nothing has changed. The children still learn in the same manner. The experts describe how children learn, and the policy makers go ahead with their own plans regardless. Possibly the ideal kindergarten furnishes the best example of the true function of the school. In a home where the mother has been well prepared for the duties of motherhood; has time to devote to her children; to direct, to some extent, their play; to tell and read appropriate stories; to teach simple songs and melodies; to furnish suitable occupation in modeling, drawing, painting, making; to explain some of the simple facts and processes that come under observation; for children in such a home the kindergarten is unnecessary. However, there are countless thousands of children not blessed with such a home. For the children of the untrained mother who does not know how to do the things enumerated above, for those of the overworked mother who has not time to do them, and for those of the over-leisured mother who does not realize her highest, most sacred duties and privileges, the kindergarten is an inestimable boon in that it does provide in a regular, well organized way, many of those experiences. The real test of the value of the kindergarten is the extent to which it carries on appropriately many of those activities, experiences, that should come abundantly to the life of the child in good home and community surroundings. For many parents in very "good homes", the gifts and methods of Kindergarten served to supercharge the development of their children, even without formal Kindergarten classes. Educational sloyd in schools was of benefit to children in just the same manner. The importance of Hands-on Learning. 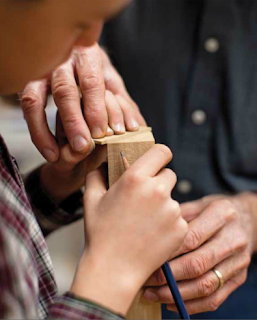 Bridging the engagement gap with hands-on teaching. The importance of hands-on learning for English learners. Purdue Study: Hands-on learning better. The following is from Susan Blow's book Symbolic Education, 1894 which I should note came well before Piaget described the steps in the development of intellect and well before studies of the brain provided a handle on learning that most current educational models ignore. Susan Blow introduced Kindergarten to St. Louis public schools in about 1878 or so. Although the growth of the metaphoric, holistic mind is available throughout our life— and when used, can be shown to result in higher feelings of self-confidence, self-esteem, and compassion; a wider exploration of traditional content and skills; and higher levels of creative invention — current teaching strategies, environments, and curricula neglect its use. Allowed at the beginning stages of the young child's learning experiences, the acceptance of this mind style disappears as we progress in school. In other words, the experts know what's needed to reform education, and the policy makers continue to ignore best policy just as they did when Susan Blow was writing about Kindergarten. Kids of all ages and adults, too, need to be engaged in the use of all their senses. We learn best and to greatest lasting effect when we do real things, hands-on. In the meantime, I've worked out a new way to hold guitar necks firmly as I rasp and sand them to final shape. One end goes in the vise or can be clamped with a large "c" clamp to the workbench or table top. The other end is supported by a long piece of wood, held to the peg head with another clamp. Having adequate support makes the process easier, more accurate and faster, too. Having adequate hands-on support also assists in the process of educating both children and adults. We learn more easily, more quickly and to greater lasting effect when we learn through the engagement of all the senses. It would be convenient from an administrative point of view to think of the human mind as linear in its growth just as the dominance of the left brain building activities in schooling demands. (All the little children sitting passively at their desks, quiet, orderly, with the teacher in full control of their little minds.) My daughter is working on her grad school thesis to finish her masters in education and is interested in finding research that supports hands-on learning. At this point she has had experience in two schools, one that supports project based learning, and the other that did not. Can you see how my mind just leaped from one thing to another and that these thoughts might be related, and that if we fail to investigate such relationships, we've failed to fully engage the powerful resources of mind? It has been pointed out that what Piaget is really describing is the development of only one of our mind styles, the linear logical style of the left hemisphere. Also, the descriptors Piaget uses are valid only in cultures that have placed their emphasis on linear-logical thought processes. What about our other mind, the metaphoric, intuitive, holistic mind valued by Einstein, Bruner, da Vinci, Salk, and a myriad of other creative thinkers who have changed our culture? Samples (1975) suggests a hierarchy of metaphoric modes within which students at any age have the ability to perform. Through the use of these modes students were found to develop more comfort and ability in exploring concepts, ideas and processes in rational ways. The first, the Symbolic Metaphoric Mode, exists when either an abstract or a visual symbol is substituted for an object, process, or condition. 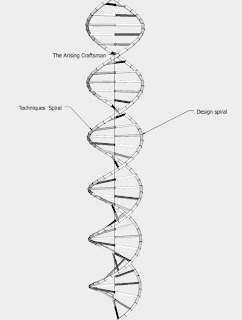 By making the visual symbolism available, understanding can be achieved even by those not as adept at deriving meaning from abstract symbolism that is, by drawing or sculpting an idea one may understand the meaning and express it through the written word. Do you have any ideas how the other mind with these other capacities might be engaged and nourished? Music would be one, art another. 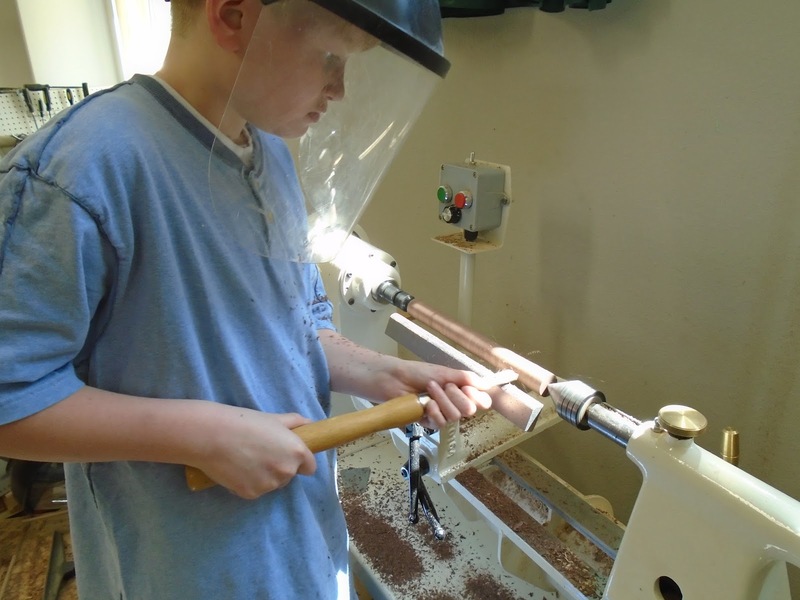 If you want to go off the deep end (relative to what's happening in most schools, consider wood shop. As to my daughter's question there is actually very little direct research into the value of hands-on learning. All the great educational theorists proclaim its value, which the administrators and policy makers thence ignore. One bit of interesting research comes from Purdue. I am trying to get my school wood shop in order for the end of the school year, and am working on box guitars, making necks. The photo above shows a peg head made to fit dulcimer/ukulele style tuning pegs. Paulownia tomentosa is a tree imported to the US from China that escaped into the wild. Its lavender blossoms make it stand out in the forest this time of year in Arkansas and across the south. In fact, as I walked across the school campus yesterday, two teachers were admiring paulownia growing in the forest that surrounds the school and asked "what kind of trees are those?" Adults and children learn best when our senses awaken us and our lessons are drawn from real life and from the real world. The day before yesterday, two students found a sick salamander and created a habitat for it, hoping it might recover. It did not, so yesterday morning, they asked if they could dissect it. I helped by supplying an x-acto knife for scalpel, pins for holding the skin aside and a board on which to pin the parts. It was an unplanned opportunity for learning, and the excitement made the whole class seem like a single beating heart. They speculated as to the cause of death, but found the very tiny organs hard to identify. When the tiny salamander body was in shreds and they could learn no more from it, they asked if they could make a coffin and have a burial ceremony. So two students came to wood shop where I was cleaning and asked if they could build a tiny box. As the students were reflecting on what they learned, choosing who was to do what, and planning the ceremony, I asked about the quality of the lesson, and why they were so excited about it. And the answer of course was that instead of it being planned for them, it was a lesson that arose spontaneously from their own interests and within the matrix of real life, involving the use of all their senses. At one point in the dissection, the smell of the salamander was so strong they left the room for a time, overwhelmed by their learning experience. The role (and the power) of the senses is to confirm the reality, the relevance, and the importance of learning. 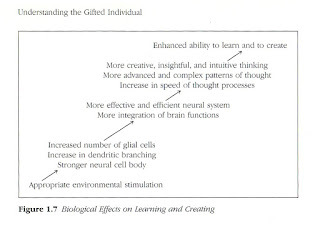 The chart below is from Barbara Clark's book, Growing up Gifted and illustrates "how the effects of environmental stimulation strengthen the brain at the cellular level, leading to enhanced ability to learn and create." The sight of Paulownias in the forest opened the curiosity of adult learners. A number of people in our local community have said, "Oh, the wisteria is blooming," not knowing that it's too early for wisteria and that paulownia blossoms are the same color. Learning from the real world excites the curiosity and learning capacity of children in exactly the same way. The chart explains how some children become easily recognizable as "gifted," and why so many do not. If we know that simple fact, and can accept it as real, why would we allow the proponents of standardized testing to isolate our children from the productive use of their senses? American education has become senseless and thereby ineffective. In fact, it's worse than that. It kills our children's natural curiosity and at the cellular level destroys their ability to learn and to create. The formula for effective learning is simple. Invite the students to do real things. Engage their senses through music, the arts, wood shop, laboratory science, theater, field trips, and all those things that were whittled away to create schooling based on standardized tests. Make, fix, and create. Extend toward others the capacity to learn likewise. The process of learning can be enhanced by increasing the strength and the speed of transmission or synaptic activity. Through changes in teaching and learning procedure, the growth of dendritic branching, the complexity of the network of connections among neurons, and the quantity of glial cells can be increased. These are the measurement differences in brains that show advanced and accelerated development. By the environment we provide, we change not just the behavior of children, we change them at the cellular level. 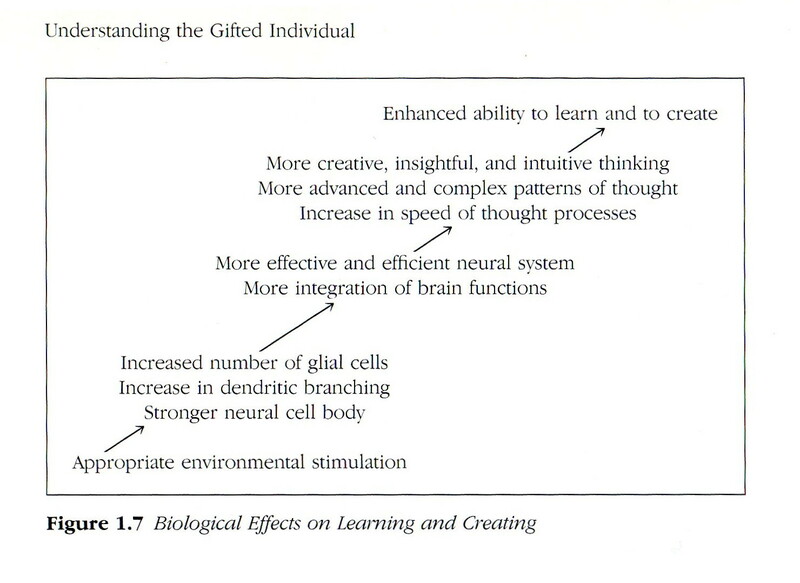 In this way gifted children become biologically different from average learners, not at birth, but as a result of using and developing the wondrous, complex structure they were born with. At birth nearly everyone is programmed to be phenomenal. —emphasis mine. The "strength or speed of synaptic activity" is a matter largely dependent on the full engagement of all the senses (and most particularly the hands). Educational policy makers developed schooling that prevents students from being as phenomenal as nature intends, by sequestering students at desks from real life. Only a few are recognized as gifted and talented, though nearly all started out with the potential to be so. Friedrich Froebel had observed young German mothers at play with their children and made some connections. He observed that the period from 3 to 8 was largely neglected in schooling and devised Kindergarten to give children a leg up on the development of intellect. But by the time Maria Montessori developed her system of teaching young children in the early1900's, Kindergarten had been distorted to the point that as many as 50 children at a time were crowded into kindergartens and the individualized nourishment needed by each child had been made impossible. Otto Salomon's methods, too, had been compromised. Take six or eight students in a classroom, allow the teacher time to answer each student's questions and demonstrate in a timely manner the student's next steps, and you get different results than you would if you crowd 25 kids in a class. Salomon was challenged by other educator's for his insistence that instruction be individualized for each student. Even then, policy makers were unwilling to invest the necessary resources to provide such an education. The biggest question in American education is whether or not we want it on the cheap, thus depriving each child the opportunity to reach full potential, or whether we are willing to invest in the lives and intelligence of our children and our future generations. It is time for parents, teachers and grandparents to take matters into their own hands. 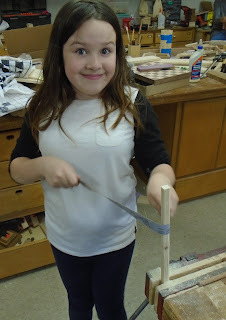 I was too busy in wood shop yesterday to take photos until my 4th, 5th and 6th grade kids were gone. They are making birdhouses. In my home work shop, I'm making guitar necks and taking photos of the processes for making 4 different styles of neck, each involving several distinct processes. Barbara Clark described the situation with regard to the brain quite well. The human brain is organized into four major systems with radically different structures and chemistry. Educationally, this organization presents some important considerations. Two of the four brain systems have no network for verbal communication. Because the integration of total brain function is the basis for intelligence, a test that measures primarily verbal communication as its sampling of intelligence may be seen as limited. In other words, the standardized testing used in American schools, being so heavily reliant on verbal communication is a poor means of measuring overall intelligence. 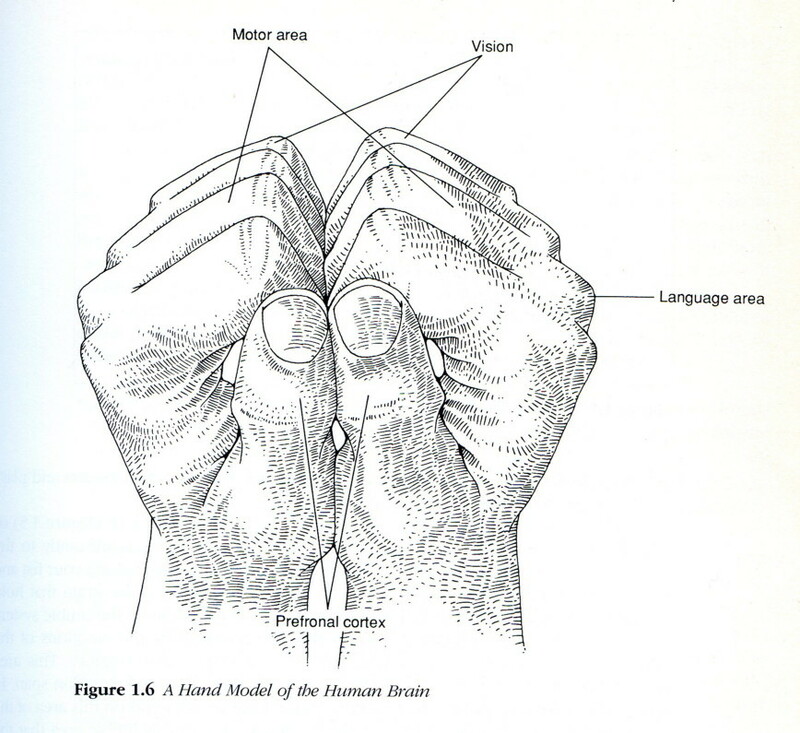 The interesting illustration at left is the use of the paired human hands, left and right held together as a model of the brain. No more fitting model for the brain could be imagined, for the hands and brain co-evolved as a system for learning, and as stated so clearly by Anaxagoras, man is the wisest of all animals because he has hands. The illustration is from Barbara Clark's book, Growing up Gifted. The following is a list of identified gifted and talented types with some insight offered as to strategies to identify and teach each. Thanks to the Brainy child website. The Type 1's are the most easily identifiable, and may account for up to about 90% of the identified gifted students in schools. They are the students who have learned the system and are well adjusted to society with a generally high self-concept. They are obedient, display appropriate behavior, and are high achievers, therefore, loved by parents and teachers. However, they can also get bored at school and learn the system fast enough so as to use the minimum effort to get by. They are also dependent on the system, thus less creative and imaginative, and lack autonomy. The Type 2 gifted are the divergently gifted, who possess high levels of creativity. They do not conform to the system and often have conflicts with teachers and parents. They get frustrated, as the school system does not recognize their abilities. They may be seen as disruptive in the classroom and often possess negative self-concepts, even though they are quite creative. This is the group of gifted students who are at risk of dropping out of schools for unhealthy activities, like getting involved in drugs or exhibiting delinquent behavior. The Type 3's refers to gifted students who deny their talents or hide their giftedness in order to feel more included with a non-gifted peer group. They are generally females, who are frequently insecure and anxious as their belonging needs rise dramatically at that stage. Their changing needs often conflict with the expectations of parents and teachers. These types appear to benefit from being accepted as they are at the time. The Type 4 gifted are the angry and frustrated students whose needs have not been recognized for many years and they feel rejected in the system. They express themselves by being depressed or withdrawn and responding defensively. They are identified very late; therefore, they are bitter and resentful due to feelings of neglect and have very low self-esteem. For these students, counseling is highly recommended. Students identified as Type 5 are gifted students who are physically or emotionally handicapped in some way, or have a learning disability. This group does not show behaviors of giftedness that can identify them in schools. They show signs of stress, frustration, rejection, helplessness, or isolation. They are also often impatient and critical with a low self-esteem. These students are easily ignored as they are seen as average. School systems seem to focus more on their weaknesses, and therefore fail to nurture their strengths. Finally, the Type 6 gifted are the autonomous learners who have learned to work effectively in the school system. Unlike Type 1, they do not work for the system, but rather make the system work for them. They are very successful, liked by parents, teachers and peers, and have a high self-concept with some leadership capacity within their surroundings. They accept themselves and are risk takers, which goes well with their independent and self-directed nature. They are also able to express their feelings, goals, and needs freely and appropriately. Gifted student types 2, 3, 4 and 5 are the least likely to be identified as G&T, the least favorable to include in G&T programs due to the challenges they offer, and the most in need of the kinds of special attention that G&T programs could provide if they were set up to help such students (though they rarely are). And so, is it not the best strategy to assume all children are gifted and talented, even though those "gifts" are not the same and are not uniformly distributed? Often, children have troubles with particular skills like reading in school, that are merely due to poor timing. Their brains may simply not be developed in the same time sequence as their peers at the same age, and yet they are then forever branded, or self-identified as dumb, rather than being acknowledged for the gifts and talents they possess. It used to be thought by many advocates of the manual arts that those who were not "gifted" in reading and writing would likely be gifted in other ways... perhaps in the wood shop. But with the destruction of manual arts programs throughout the US (with certain rare exceptions) non-desk skills and intellect are no longer held forth as an option. Make, fix, create, and extend the vision that others may learn likewise. 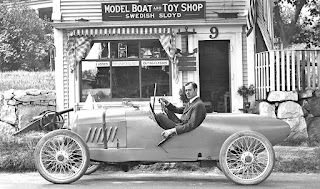 Yesterday two friends (independently) sent me links to a blog post on Old Motors, with this photo of a speedster in front of a shop offering Swedish Sloyd. 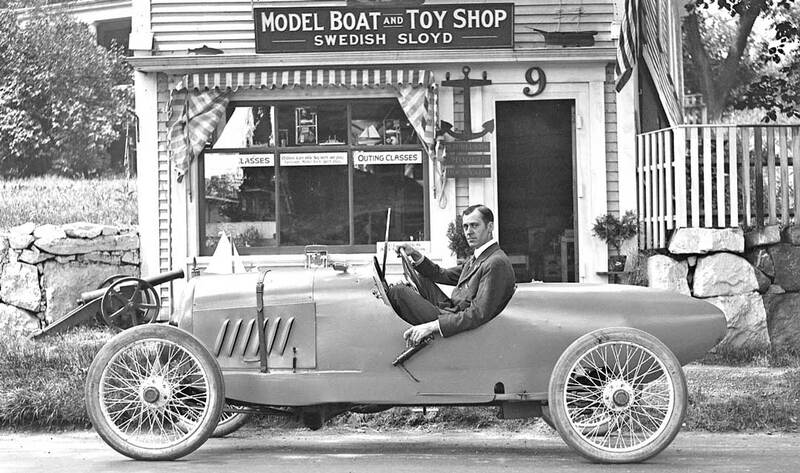 The photo from around 1916, shows that some Sloyd instruction was offered in some places as a commercial enterprise outside formal schooling. A sign in the window indicates they also offered "outing" classes, which I assume referred to outdoor education... a thing also denied to most children today, even though the need for it has grown enormously. On Friday in our school staff meeting we went through the student body, one student at a time, identifying the special gifts and challenges of each child. It was a way that we could discuss strategies through which we might better serve each. The following definition is given for students labeled as "Gifted and Talented:"
All but 8 states offer special funding for gifted and talented programs in public schools. All but 8 states make a special effort to identify particular students as "gifted and talented," and provide funding to provide individualized learning opportunities for certain children in school. But it is reasonable to argue that ALL children have particular gifts that will be neglected in schooling, and ALL students have the potential to develop talents that will not be nurtured in school due to the lack of individualized attention. The problems I have with the definition offered above is that it is left up to the child to "give evidence." Good teachers are constantly seeking evidence on their own if they are not overwhelmed by overly large class size. Dr. George Betts and Dr. Maureen Neihart are the renown experts for establishing profiles for 6 types of gifted and talented students and although I may disagree with the label, "Gifted and Talented," far more students would fit than most schools would allow. This link, The Revised Profiles of the Gifted and Talented offers a key to identifying 6 types of G&T students and provides strategies for meeting their needs in school and at home. Types one and six in the chart are the ones usually selected for participation in gifted and talented programs because they are the ones most motivated to make such programs a success. School gifted and talented programs tend to do their selection at both ends and choose not to address those students in the middle that may be more difficult and challenging to serve. The answer, it seems to me, is to offer gifted and talented education to all kids and to stop identifying only certain kids as being Gifted. If all schooling involves sitting endless hours at desks, rather than running, playing, playing music, creating art, learning directly from nature and building things in wood shop, how will students become talented at anything but taking tests? 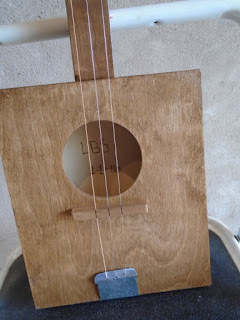 I have been at work on a cigar box guitar kit, as a way to begin outlining the parts of a guitar. It all comes in the box. The neck is marked where the frets would be. All the necessary holes are drilled in it, and all the parts are in the bag. If I was not interested in finishing the neck with urethane, I could have been done with it and playing in less than an hour. But instead, I took my time, applied three coats and used a wood burner to mark the dots on the neck. The other side of things takes a bit more time. If you want to make the box for a box guitar, some box making skills are in order. 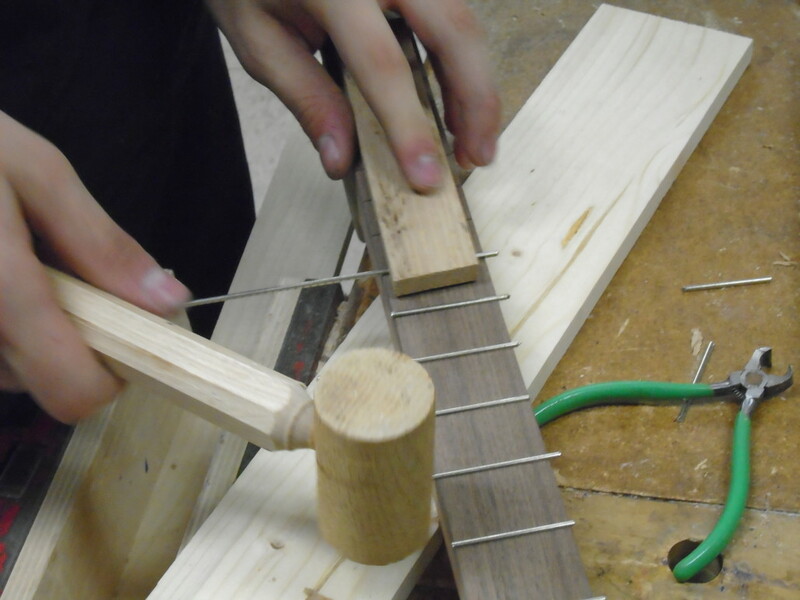 If you want to make a fretted neck, either a sawing jig, a marking jig, or math are required. If you want the neck to feel good in your hands, some shaping and sanding are required. So you can go as deep into the craftsmanship involved as you choose, and as your patience allows. My book about making box guitars will break the guitar down into component parts and explore each, then mix and match offering the reader the chance of making his or her own guitar unique. I have been asked about the relationship between Educational Sloyd and the Kindergarten movement. If you had attended the 1876 Philadelphia Centennial Exposition, you would have discovered a Kindergarten classroom where adults stood mesmerized by children learning. If you visited the Swedish School House, supplied by the nation of Sweden as their national exhibit, you would have found a display of models provided by Otto Salomon's Sloyd School at Nääs. On the other hand you might have missed these important exhibits, drawn instead by the 11 acres of machinery, driven by the world's largest steam engine, and the Russian system of industrial arts education on full display. But when Educational Sloyd was invented by Uno Cygnaeus in Finland, Kindergarten was very much on his mind. He had wondered how to carry the Kindergarten methods into the upper grades to enrich the learning of older students just as Kindergarten enriched the lives of the young. He relied on the lives and methods of Pestalozzi and Froebel to guide his path. From their early days in schooling, both educators placed emphasis on the use of crafts as an educational tool. Pestalozzi had asked for the development of an alphabet of skills commensurate with the alphabet of letters that had become the bane of most schooling. Froebel had his students of all ages building things, making nets from string, and crafting objects as important elements in their learning. Froebel was himself, a wood carver and the creator of his first gifts. If you attended Otto Salomon's school at Nääs, you would have been informed by his lectures on pedagogy, delivered in 4 different languages and instead of just learning how to work wood, you would have learned about Kindergarten, the kindergarten method, the history of pedagogy and how to engage students in real learning. It is a great shame that students learning to become teachers are not taught those things today. But if they were, they might have unreasonable expectations concerning school. They might attempt to take a child centered approach and place themselves at odds with the powers that control education. Teachers who knew the full history of education would know that confining 25-30 kids at desks is an unreasonable and wasteful classroom exercise and would rebel against it. The guitar shown above was made from a kit. Make, fix, create, and extend to others a love of learning likewise. The Kindergarten - Froebel Teaser Trailer from Match Frame Creative on Vimeo. Please click on the trailer above to watch full frame. The Kindergarten documentary I helped to sponsor on Kickstarter is moving forward, and I hope it has a positive effect on education. Scott Bultman plans to divide it in 4 parts, including one about how the very nature of Froebel's invention became distorted as it was applied popularly worldwide. Maria Montessori's methods were devised in opposition to militaristic application of Froebel's methods with as many as 50 kids in a class. Final episodes will address its promise for today's education. The very idea of children learning to love learning is one whose time has come, and come again, only to be distorted again and again by those who demand education based on the cheap. We might think that learning how to learn is a big thing, but we are actually hard-wired through the hands for learning. It's when the hands are kept out of the learning process that learning to learn comes necessarily into play. How are we to learn without ever doing anything? Can we not re-engineer schooling to take advantage of how children are wired to learn best? That was what Froebel did in his invention of Kindergarten, and what Cygnaeus and Salomon attempted to do with their invention of Educational Sloyd. 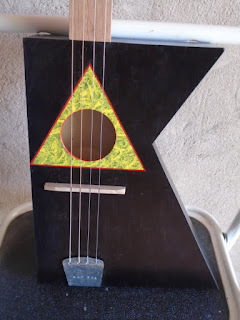 I have completed a "K" body guitar for a benefit auction for Max Elbow, a local artist who has had serious health problems, and limited resources. Photos are shown above and below. I was surprised when I was in Portland at the Educator's symposium, that when I mentioned Howard Gardner, most of the teachers in the room seemed to be unaware of his theories and groundbreaking work in American education. Fresh weeds do grow up each year to obscure the best soil. Howard Gardner in his work "Frames of Mind" described how we are smart in a variety of different ways beyond simply being school smart. Before Howard Gardner some kids might have been identified as "street smart," and as having abilities to get along in the real world that would be of no use to them when confined at a desk. Howard Gardner took the basic senses and applied them to an understanding of mind and recognized that some children had a strong inclination to be musical, some might be happy all the time with their noses stuck in books, still others needed to be running, and others are haptically inclined. He came up with about 7 ways children are smart, with several of them being beyond what could be narrowly defined as "desk smart." To break things down more clearly and distinctly, we can use "street smart" and "desk smart" as a dividing line between what works and does not work to engage all minds equally in learning. Desk smart involves passive learning in an environment sequestered from real life. Desk smart learning makes an effort to isolate the child from its normal range of senses to focus on reading. Street smart learning engages the full range of senses in the thick of real life and thereby has far greater effect and effectiveness. Those things that are learned from the real world and from experience are learned to greater lasting effect. From Howard Garner's recognition that we learn in different ways and are smart in different ways, some educators attempted and are currently attempting to engineer learning so as to include each specific learning style in the same classroom. It's a noble enterprise, but a challenge. It puts a burden of engineering on the teacher who has learning style predispositions of his or her own to overcome. In fact, most teachers become teachers because of being "desk smart." To conceptualize a classrom learning environment in which students' senses and bodies are fully engaged would be a desk bound teacher's worst nightmare. But when you do real things, all the senses are thus naturally engaged, and so the doing of real things, hands-on, can serve as the model that all schooling must learn to follow, IF we choose to offer meaningful and productive education to our kids as Freobel and his early followers attempted to do. The same applies also to adult learners. The difference between child learners and adult learners is that child learners are more generally forced to sit at desks. Adult learners are often empowered to choose alternative learning opportunities, and even when sitting at desks are likely to be engaged in doing real things. Children in schooling, on the other hand, are trapped by their desks in senseless isolation from reality. what I can do this day. Our plans to build a new wood shop for the Eureka Springs School of the Arts have been pushed forward by receipt of a major grant, as was announced in our board meeting yesterday afternoon. That means that in addition to my regular work, I'll be involved in planning, and additional for a new woodworking building and equipment over the next year. Groundbreaking will probably take place in October with construction complete in time for occupancy in May or June. Along with the construction, we are hoping to enlist new corporate donors to help fund construction of a dormitory for young students and lodging for visiting staff. By enlisting the support of corporations we hope to get the leaders of those corporations to better understand the value of hands-on learning. The point, of course, is that we all learn in much the same manner if given a chance. The hands are essential. Adults learn to do by doing and learn to think by doing and reflecting on what they've done. And children are the same way as evidenced by what Piaget described as stages intellectual development. Those stages begin with the senses and development of the motor skills. The senses and motor skills thence form the foundation for all subsequent learning, and establish important values within human culture. By setting the hands and mind apart, we've lost the heart of learning. Today in the wood shop I'll begin work on a chapter about making necks and put strings on the guitar shown above. I have been having my students write reflections on wood shop. They may write about what they want. Can it be improved? If so, how. How do they feel about their work? What are their favorite tools, or projects, and if so, why? Some of my students are reluctant writers and will have to redo or supplement what they've written. Some of their responses have been informative. Some have described how much the woodworking experience means to them. Oen, in second grade said only that he likes to be where there are so many tools. One student noted that he pays so little attention to me, that its as though I'm not there. I think we have some work to accomplish in his direction. 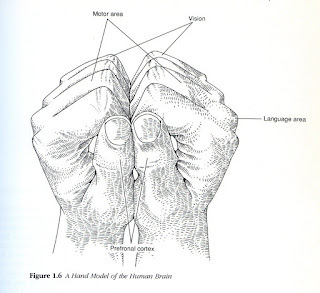 My point in this exercise is that it concerns the essential connection formed between hand and mind. At home we have a plumbing leak between the well casing, and the pipes that bring water to the house and the plumber is coming this morning to fix it. Yesterday, workers dug a deep muddy hole to uncover the pipes and this morning we'll drain the accumulated water from the hole, so the plumbers can proceed with repairs. The problem is that dissimilar metals tend to corrode where they are connected due to exchange of ions that pass between them. The pipes in the well are supported by a bronze fitting that connects through the steel well casing the steel pipes in the well to the steel pipes that carry water to the house. The whole apparatus is thoughtfully conceived of dissimilar materials. In a way, the hands and mind, and the relationship between can corrode just as happened in my pipes and as we can witness in modern society. They may seem of dissimilar material. The hands are all about sensing and doing, while the mind can journey on (and on) its own in conjecture and fantasy. And the mind full-blown can become dominant even up to the very edge of that bitter end at which the hands are forgotten, pipes leak, and society falls apart. In the woodshop, it's not enough to mindlessly move the tool back and forth, expecting marvelous things to happen without constant attention and mindfulness. Outside the wood shop, you can't just think about things and make them happen. 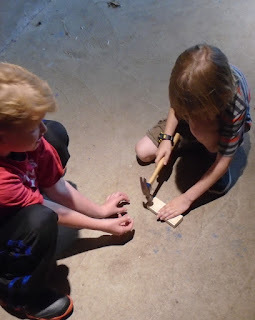 I had done a blog post over a month ago that listed various occupations that require hands-on learning. It might surprise you. Hands-on for what? Today in the woodshop, we are beginning end of the year service projects. We need to build garden gates for the CSS vegetable garden, so as some are finishing their guitars, others will be working on design. My 4th, 5th and 6th grade students want to build bird houses. I will leave room for creativity in that. And I'll ask my students to be attentive to both hand and mind and attempt to repair the connection between the two. Can I take it home now? I hear that question a lot in wood shop. Students love the evidence of their own learning. I am reading through reflections I had asked my students to write in wood shop, about their favorite tools, about favorite projects, about things that they feel should be improved, and I get very strong favorable responses from most kids. On the other hand one student wrote only, "I love woodshop, I hate writing reflections." Still, it is important in schooling to have both. Another told me honestly, that she didn't want to make a guitar. She felt forced into it and a bit resentful. But now that it's done, she's pleased with it. Lee Valley/Veritas Tools in Ottawa is a very strong supporter of industrial arts programs and featured a high school guitar making program on the cover of their new catalog. An article describing it can be found here: Fourteen polished, playable six-string axes, each one crafted by a GBFP student, grace the cover of the Lee Valley Spring 2016 catalogue. Circulation: 570,000. Most ot the recipients of those 570,000 catalogs will probably be hands-on learners themselves and will recognize the value of the work that students can do in school, and perhaps yearn to have had that kind of experience themselves. The biggest question, is when we will choose to do something about it? We can let schooling proceed in its merry, destructive way, or parents, teachers, and grandparents can take matters into their own hands. real ways to assess real learning? My daughter Lucy is teaching at Harvest Collegiate in New York City. This is her second year of teaching, but her first of real TEACHING in which she is trusted to engage children's passions for learning rather than confine them to seats and prepare them for bubble tests. 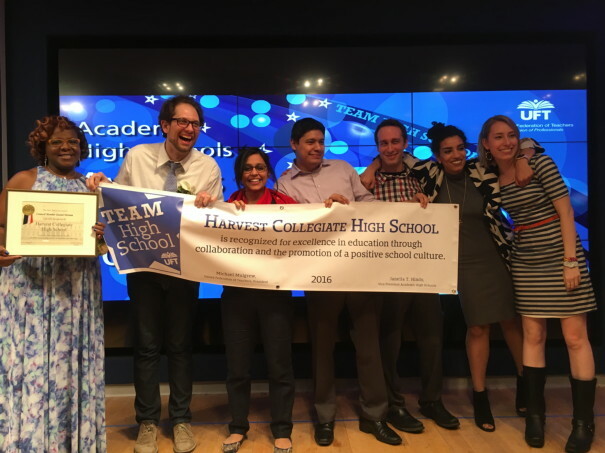 An editorial We need real measures of learning by the head of the New York Teacher's Union, Michael Mulgrew, helps to explain where Harvest Collegiate fits in. For surely parents and most teachers are all fed up with bubble testing, and ready to rebel against the stupidity of confining children to learning from and by the book. We all learn best, children and adults, when we (particularly our hands) are engaged in doing real things. We all know that to be true in our own lives, so why do we not design learning for our children that utilize their natural inclinations to learn? Here's a short list of what's been lost or marginalized to support standardized testing. Shop classes, music, theater, culinary arts (Lucy leads the cooking club), athletics, poetry and the visual arts. On Saturday, Lucy's school was honored with a special award from the United Federation of Teachers for its collegial relationship between teachers and administrative staff. Just as in Finland, where teachers from all over the world are visiting to discover how their methods lead to real learning, the same is happening on a smaller scale at Harvest Collegiate. In Finland the strategy is simple. Hire the best to be teachers, prepare them well, provide them with mentors, and trust them to teach. In the photo, Lucy is at the far right. In Arkansas this week, the state board of education announced the results of standardized testing in public schools across the state, and noted a serious decline. They insist the results reflect the use of more difficult tests. The sad thing is that the best results rarely come from top down imposition of standards. They do arise from the collegial efforts of teachers, parents, administrators, and yes, children. And believe it or not, children in all kinds of real activities, and under the right circumstances can set very high standards for themselves. Today in the woodshop at the Clear Spring School, my older students will be working on their box guitars and my upper elementary school students will reflect on the use of the tools and games they made for their Arkansas travel. I have been going through the shop, finish room and office moving things into better places, and then delivering work that should be sold to make room for more. I've also set up my temporary photo booth so that I can take photos of boxes to sell on Etsy.com. The tool cabinet I bought is helping to me to organize and put things away, and making room in other cabinets for further organization to take place. Just like when a check bounces at the bank, there are serial effects when something new is added in a woodshop. My hope is that I can get the shop in good shape prior to a visit from an editor of Fine Woodworking who is tentatively coming in June to work on articles with me. I am also starting the book on box guitars and have gotten excited about the possibility of putting lids and doors on them to make them more box like. Why not? The boxes above are the prototypes for my 2 day box class in Portland last month, and I plan to either sell these or use them in an auction to raise money for charity. I got a copy of Hans Børli's book, We Own the Forests, that has side-by-side translation from Norwegian. Børli was a lumberjack and poet as I mentioned in an earlier post. His situation helps inform us of the correct relationship between hand and mind. It illustrates that even though or more certainly because one is not ensconced in an ivory tower, his or her intelligence may be in full flower. I have been finishing boxes (after first sanding to 320) and finishing the paint job on a "k" body guitar. I have also been using a new mechanic's tool chest as a means of clutter eradication in my wood shop in preparation for beginning my box guitar book. I've lined the drawers with the cardboard the tool chest came in so that it can hold sharp objects, and I still have about 4 drawers to fill after loading it with router bits, drill bits, and miscellaneous tools. A few small power tools will fit behind the doors. I visited an interesting website, urged on by a book about band sawn boxes published by Spring House Press. 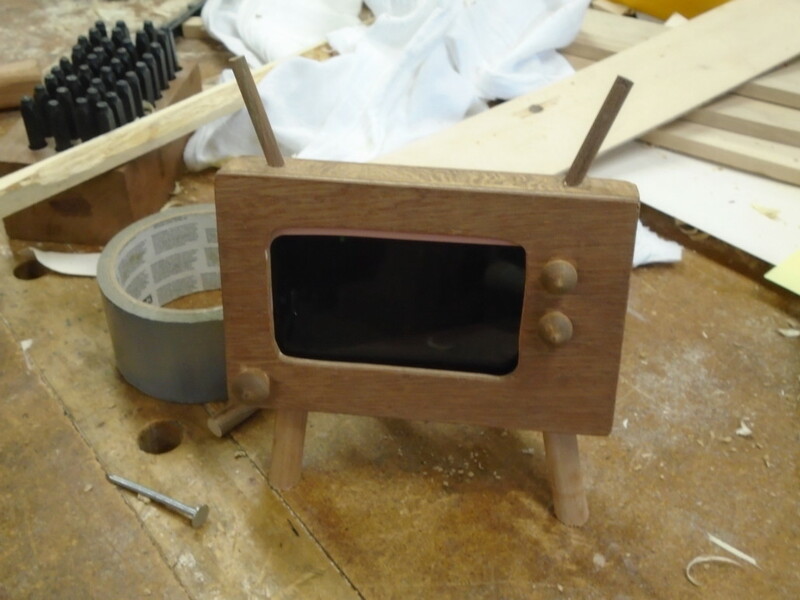 David Picciuto's website makesomething.tv is a fun place with a fun guy who puts some clever zip in woodworking that may help to inspire some younger folks to join the woodworking fun. I invite you to join the woodworking fun. On the other hand, in a blog post concerning how much to charge for work, he offers some unreasonable advice. He suggests that woodworkers and other craftsmen figure out what they need to make in a day and establish prices for their work based on a "day rate." How to price your work, a simple technique. His suggested starting point is $500 per day and claims that his own day rate is a thousand bucks. What if you are just starting out? Would you expect to be as efficient and productive as a more experienced woodworker? What if you are just starting out? Will your work be worth buying? What if you made a bunch of stuff and you've set up at the local craft show or farmer's market to sell your work? Do you expect your day rate to also cover the time spent selling your work? In my experience, those who ask questions about how much to charge for their work are the same ones who've just begun developing skills, and whose efficiency and artistic vision have not been refined by continuing exercise. One of the world's most foolish metaphors is that "time is money." Whether you are working by the hour or by the day, the metaphor "time is money" robs you of other things, the joy of the work, the pleasure you can take in it and the other values you receive from it. By focusing on the money you will be missing some things of even greater value. I realize this doesn't answer the question so many woodworkers ask, "How much should I charge for this thing I've made?" To that I ask, how attached are you to it? Would you buy it yourself? And if not, why not? What are the non-monetary attributes of it? How did making it make you feel? And if it's worth making in light of how you feel and compensates financially enough for you to continue and save a bit each day, perhaps you've found a working formula for price. 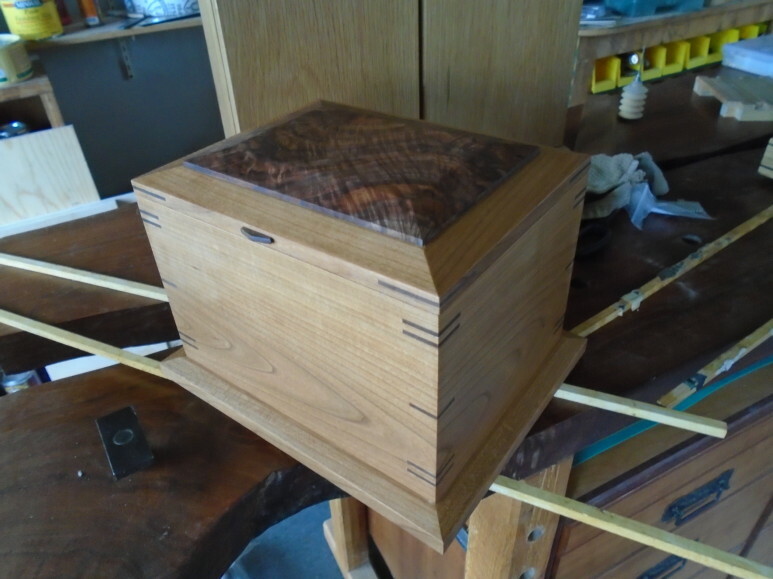 Cherry and walnut with tray inside. What about the idea of making something lovely without regard to price, building something significant and lasting within human culture or that might touch and enhance in some way the lives of others in your family or community? Here in Eureka Springs people (including my wife and I) volunteer the time each day to a variety of causes because they choose to make the world a better place. If every maker tried to follow Picciuto's formula we'd all be left buying and selling products from China and never make a single thing, for who would pay us what we are clearly not worth in an economy overburdened with meaningless stuff? Make, fix, create and reflect. Inspire others to love learning just as you do. As we move closer to the end of the Clear Spring School year, I begin thinking of my summer classes and preparing for them. All three classes at Marc Adams School and my week long class at the Eureka Springs School of the Arts are full, so I may have to find some other means to help adult students learn. Any suggestions? The other challenge is finding more time in my life. The "K' body guitar in the photo above is one I'm making to be sold in an auction to raise money for an artist friend who is ill. I had originally planned to have a student paint it, but time is short and in order to get it completed in time, I decided to decorate it myself. Doing my own work on it, it could be finished today, as these things are so easy to make. I'll take photos of the finished guitar for use in the book I'm about to write, "A box maker's book of box guitars." One of my students making an electric guitar decided that the hole in the back left to access the electronics should be left as a door so she can keep things inside, like picks and slides. Of course that could lead to a chapter on lids and doors. Today I will be applying finish to boxes and a small cabinet, and continue a reorganization of tools in my shop. I have only about 5 more weeks to finish the school year at Clear Spring and some of my students are getting finished with their guitars. Some are naturally done more carefully and quickly than others, largely related to how much interest they have in craftsmanship vs. other things. Students who listen and take instruction well have made greater progress than those who've taken a more experimental approach. As they finish, I will offer them time to develop greater skill on the lathe, or to begin short term independent projects of their own design. My upper school students will lose one week of wood shop time due to travel school and may not finish their guitars in time, depending on how well they have been engaged up to this point. There is a saying about leading horses to the water trough. Just as one cannot force a horse to drink, you cannot force a child to learn the things you hope they might learn, and so rather than waste your time or theirs, it makes sense to make allowances. Today I'm writing without having much to say, except about the business of each day. The feral pigs returned last night to do further damage to our garden beds. Stopping them seems to be beyond our capacity and beyond our will, in that we are unwilling to have our lives completely disrupted by them. I bought a motion detector that would have warned us of last night's visit but my wife refuses to have our sleeping and waking hours disturbed by every chip monk that runs across our lawn. We'll take photos today to share with our local county government and make a presentation at the next meeting of our county supervisors. The guitars at left are among those that received strings in yesterday's woodshop. We had dinner with a friend from Norway on Monday night, and she was a bit delighted that I could understand a bit of her Norwegian. So in 138 days of studying Swedish and Norwegian using Duolingo.com, I've made progress. Choose a language and study for a half hour each day, and you'll have not wasted your time. I have only three classes today at Clear Spring School as my upper elementary school class is on their school trip. My middle school and high school students are finishing their guitars. In my home shop I'm needing to finish a few things to be able to get them out of my way and into galleries to be sold so that I can make room for new work. A complete cleaning and reorganization is in order from one end of my life to the other. I noticed in an article in Time Magazine that colleges and universities are once again wrestling with admissions standards. They need diversity of thought and diversity of appearance within the student body to sustain higher standards of institutional self respect. Grade point averages and test scores proved to be a poor means of assessment to predict student fit. Now they are using other tools including social media as a metric. Makes sense, right? If during lectures for which parents or benefactors have paid enormous sums of money for students to attend, the students are paying attention to facebook instead, then perhaps grades and assessments in university courses should be based on facebooking skills. But are there such things? We know that the purpose of each new iteration of software and hardware is to make things easier. The idea of technology is to take things that were difficult and make them easy for all those who can afford to buy in. And yet, the true rewards that come to us are through those skills that have remolded the character, the intellect and the sense of self through the effort we have applied to learning. One thing about technology that should be noted. 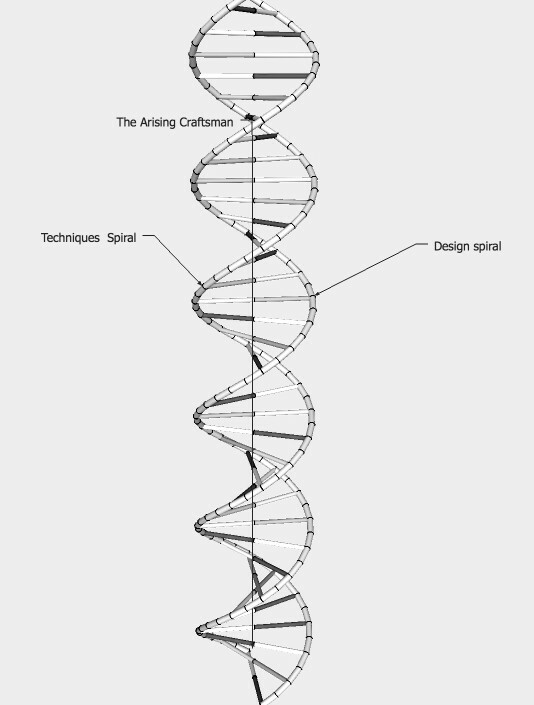 It is always spinning beyond itself, and beyond its practitioners who are always left awaiting the next big thing. But we can choose where we buy in. We can choose to do things that are difficult and rewarding. Or we can choose not to discover our own real power. The boxes above are among those awaiting finish. Yesterday I received an advanced copy of my new book Build 25 Beautiful Boxes to review and correct prior to its release in May. I am given a few days to read through and suggest limited changes I might make. It is a well crafted compilation of projects from my first two books and includes the philosophical sidebars that I had hoped would lead woodworkers to think more deeply about their work. It's rewarding for me to see my old books given new life. At school yesterday, my 4th 5th and 6th grade students finished their tools for their trip to South Arkansas. they made sieves for diamond mining, and digging tools for crystal digging, and by tonight will be at Old Washington where they will have a dance. Travel school at CSS is a way to make real that which they've studied or will study in the classroom, and its true that being there and doing real things enhances the depth of learning and the depth of engagement. Our students, in their travels, also bring back to school ideas that make Clear Spring School a better place. Our school Ga Ga court is an example, as the students brought back the experience of playing the game from travel to a neighboring state. The guitar above is one that I've made for a charity auction in support of an old friend. One of my students has agreed to paint it, and it will be a gift to the auction from Clear Spring School. I'll give boxes. come in and get to work. In about 1966 I had saved enough money working in my father's hardware store to buy my first car, a 1930 Model A Ford Tudor Sedan. It cost $400 and was in need of complete restoration from the top bows down. I had made arrangements with a friend in Valley Nebraska to help guide me through the process. I would do all the work and he would provide the place for it and the necessary instruction when I was ready for it. I could hardly wait to get started. While the car was still sitting in our driveway in Omaha, I began tearing it apart. I removed the fenders leaving it open wheeled both in front and back, not realizing that to drive an open wheeled car with no license showing from Omaha to Valley, a distance of 30 miles was not a legal trip for me to take. I was about half way there when I saw a state patrolman pass in the other direction, and I watched in the rear view mirror as he stopped, made a u-turn, and headed after me in pursuit, flashing lights and all. I pulled to the side of the road and he walked up to my open wheeled antique car, incredulous at what he'd seen: A scrawny teenaged boy with glasses driving a fenderless, illegal car. I explained that I was beginning the process of restoring it, and pointed to the four fenders (including license plate) stacked in the back seat. He could see the truth of my tale and followed me the rest of the way to Valley just to make sure the police did not hassle me on the rest of my way. Those were different days, but I hope that the response from authority might be the same today if adults were to witness kids in the pursuit of meaningful learning, even if those pursuits led them into the world at large and in conflict with the law. I am having a bit of trouble with my 4th, 5th and 6th grade students coming to class and not getting right to work. Part of the problem is that my shop with so many projects and activities at so many grade levels tends to be disheveled and in need of thorough reorganization. The second problem is that they've had five projects going at once with the confusion that entails when each has questions about his or her next step. Today I plan to set up stations at which they can do particular exercises while they wait their turn for my attention. I would prefer that they spend whatever time they have in the wood shop gathering and developing skill of hand and mind. Teaching is just like any other art. You have days when the hand puts the line straight on paper with fluid ease, and days in which you may struggle to overcome the various challenges of life. And in the full scope of things you attempt to get better at it even when no one notices but yourself. Make, fix, create, and expand the scope of schooling so that others may learn likewise. I spent some time yesterday replenishing our firewood supply following what was a mild winter. If you followed the link to the Norwegian 12 hour firewood special, and observed how carefully some Scandinavians stack wood, you might be a bit disappointed in my work. But then, my wood is oak, not birch or alder, and the oaks in Arkansas do not grow very regular or straight. Arkansas wood does not provide the best material for artistic stacking. Arkansas hardwoods are also hard to split, particularly where there were branches in the wood. I use a 35 year old monster maul, and regard it as exercise. My wife had asked why I don't rent a hydraulic splitter and get the job over with. But I have reasons of my own. There's pleasure when the maul hits just right and the wood falls apart in a single stroke. Some of the larger rounds have to be broken off the edges in chunks before they are large enough to move. I also discovered a timber rattler asleep among the logs. The weather is still a bit too cool for them to be active, but he rattled his tail in warning as I bent down with the phone to take the photo at left. His colors and pattern are perfect to blend with the leaves. Stretched out he (or she) would have been about 2 feet long, and they say if you find one, others may be near. So I became wary as I reached down to pick up wood. In the shop at school and at home, I'm working on guitars again. A k-body is shown with a Baltic birch top being glued on below. For tops on two walnut bodied guitars, I found a piece of western cedar which I've resawn and book matched to adequate width. It has a surprisingly tight grain resulting from slow growth, about 20 years to the inch.Western Cedar is a prized sound board material for guitars, so these will be nice. I am ready today to begin some materials preparation for making box guitars. The new book will be broken down in chapters the way a car is broken down for parts. Instead of making box guitars one at a time and leading the reader through steps over and over on each guitar, I'll make sides in a variety of forms, take varying approaches to the making of necks. I'll put frets in some and not others, and some will be electrified, others not. So today I'll resaw and plane tight grained cedar for tops but also offer the reader the option of Baltic Birch. I, too, have a jumble of firewood cut last summer that awaits the mall. I have the choice of renting a noisy gas driven hydraulic splitter and going through a back breaking day of grinding labor, or I can grab the monster maul and whack for an hour each day until done. Which would do my spirit the most good? With Valium the doctor would never suggest that you take the whole bottle at once. Make, fix, create and offer to others the joy of learning likewise. Make a "k" shaped assembly of wood. I am reading Lars Mytting's book Norwegian Wood, translated from Norwegian and published in the US. It is a lovely book about firewood, forests, and the human connection to the forest, and like all knowledge that comes in book form it is only a sampling of the depth of the relationship we have with trees. They say about movies, "you should have read the book." Books usually offer interesting details that the movies leave out. When it comes to books, might I humbly suggest real life? There are subtleties that are always left out in the telling, that books cannot convey. But for a culture that's losing touch, that thinks a fireplace is where a fake fire burns gas; for a culture that needs to reconnect with some level of romance, Norwegian Wood might be a good place to begin a process of reconnecting life to the real world. The book begins with a poem by Hans Børli, a Norwegian who was lumberjack by day and poet by night. Ah, the scent of real wood.We can speak of it, but if a person has not split a birch log or an oak, or whittled a stick, how can he or she know what anyone's writing about in that regard? Even the movie won't do it for you. For if all the senses are not engaged, how can you say you were there or that you learned something real. Yesterday I found myself in a conversation among writers. Good ones know that real life is our most important resource and it's easiest to write with certainty and clarity about what we know. So it is best to do first, and then write. And if doing, edit your efforts. It's best to do difficult and demanding things that command interest in those you hope will read your work. Lumberjack poet? Would that not be easier to relate to and more necessary to human culture than the purely academic? Today one of those writers from yesterday's conversation took her students for a walking/writing exercise in which they were led out of the classroom and onto the streets. Today I had a talk with one of my publishers about what will become my 11th book, and I'm making a k-body guitar for one of my students to paint for a benefit auction for a friend of Clear Spring School who's ill and in need of help. I am very proud to live in a community that's generous, and am particularly proud to live in a community so focused on the arts, as artists tend to arise generously to each occasion. There are five regions in Arkansas noted by the Arkansas Community Foundation which held a state-wide online fund raising event yesterday. For 12 hours people got online and made contributions to their favorite non-profit organizations. Mine were the Clear Spring School and the Eureka Springs School of the Arts. It is interesting to compare the results, region by region. While Northwest and Central Arkansas have lots of money to give to favorite causes, Southeast Arkansas has long faced extreme poverty, a situation that should remind us that some of the problems we face are national in scope and cannot be easily fixed by a few folks donating a few bucks. I invited one of my students to try the new stock knife made for Clear Spring School by Bob Patrick. He quickly informed me that it was too hard for him. I would have been embarrassed to have given up so quickly. But I was raised before digital technology came forth to make everything that was once difficult for most, easy enough that it can be done by anyone with a smart phone. I was aware at an early age that I felt better about myself when I did difficult things, and I learned that by being challenged to do such things. Researcher Kelly Lambert described "effort driven rewards" that come when we attempt to do difficult things. If we choose to only do those things that are easy for us, we deprive ourselves of the neuro-hormones that help to sustain a positive sense of self. We are also damaged long-term when we fail to amount to much other than what everyone else can do pretty much in their sleep. I was also intrigued by an interview with Hope Jahren in Time Magazine. She is a geobiologist and in response to women tweeting images of their freshly decorated nails, she tweeted images of her own hard working (soiled) hands with the idea that hands are essential expressions of our humanity, and that hands that actually accomplish real things deserve as much attention (or more) as those used only as adornment. Yes we know that hands can be beautiful, and that they are central to the human experience, and its OK to spend some time keeping them lovely. Others might (on the other hand) become interested in being of some special service to themselves and to humanity and get dirty in the process. Hope Jahren's book Lab Girl deserves its standing as a best seller. And the interview in Time Magazine might lead you to understand why. I wonder why almost all those involved in science seem to have a higher degree of common sense, while so many in the national political arena do not. Can it have something to do with the hands? Charles H. Hamm had said that while the mind seeks the truth, the hands find it. Lawyers in politics tend to think truth has to do with what you can convince others. But you can't use your words to simply change reality at a whim, no matter how many nincompoops you can persuade to your false position. Reality has its way of catching up. I am now nearly finished with my tiny boxes book. All the needed files, photographs, drawings and materials lists have been reviewed and delivered, so the book has been moved to the production stage. I have a new tool set up for my students to try. It is a classic stock knife made for me by Arkansas Blacksmith, Bob Patrick. He made it early last summer but I finally got around to setting it up on a stump at school and found that the design works. I had sent Bob a sketchup illustration of what I had in mind and that I hoped to learn to make for myself. 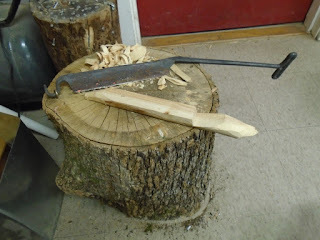 He improved it with a hand forged "T" handle that gives greater directional control, allowing you to take either a deep cut or a fine shaving from a piece of wood. Stock knives have been farm tools for centuries. They have been used by craftsmen to make handles for various tools, but have also been used in the making of wooden shoes. My sincere thanks to Bob Patrick for this fine tool and the chance of learning from it at the Clear Spring School. I need to raise the block on this one to a more useful height. The stock knife can do many of the things you can do with an axe but with greater control. I am uncertain whether it was ever considered as a tool suitable for Sloyd. It provides a great deal of leverage when compared to a knife, but is used primarily at the end of the stock. Students today at Clear Spring School will work on their guitars, and my upper elementary school students are finishing projects related to their school travel next week. If you want to know what high school students were supposed to know and figure out in 1912, go here: Bullitt County History Museum. Take the test and compare what kids were expected to know then with what kids know today. Is wood shop fun or what? We are working on a strategy for the extermination of feral pigs from our garden, which includes a possible electric fence, a motion sensor alarm, and possible acquisition of a dog. In the meantime, every time the feral pigs attack (which they have done three times), they leave with the garden beds looking as if they were carelessly roto-tilled. They throw large stones effortlessly aside with their snouts so that the walls that we carefully built during our decades around our home no longer restrain the soil in our garden beds. Norwegian television broadcast a full 12 hours of wood related programming, that included watching fires burn and folks splitting wood with an axe. The program was called Nasjonal Vedkveld, and the title refers to the field of wood splitting which had once been a national (and necessary) past-time. If you watch long enough, you can see an interview with the author of Norwegian Wood, and hear a saw being played... a tune "Goodnight" by Ragnhild Zeigler. In any case, we take life for granted, and should celebrate the kinds of labor that hold human beings in closer relationship to the natural world. A recent study of dreaming suggests that human spirituality is one of its effects. I believe the same thing can be said of staring into burning embers, most particularly when the fire is one that you've started and built from wood that you harvested yourself. As you may have noticed in your own experience, to sit by a fire, or to whack wood with an axe and to hear it split along the grain, are wholesome activities, that exercise the body, the senses and the mind. Thoreau had talked about firewood having warmed twice... once when it was cut and stacked, and then again when it crackled in the fire. There is still something he failed to mention perhaps because folks imaginations were not digitally dulled as they are today. We feel something in the spirit when we are engaged in body and mind. American television might take a lead from the Norwegians, and offer low-keyed programming that showed real people doing real things. Yesterday in the wood shop at CSS my students worked on their box guitars, with several of them coming close to completion. My upper elementary school kids are finishing their projects related to their travel next week. In the meantime, my book of Tiny Boxes is in the last stages of editing with the chapter on Japanese puzzle boxes demanding close review. Make, fix, create, and allow the natural world to entice you into learning likewise. pigs for the third time.